But what caused the fall… of the old Wolverhampton music hall? The tragic loss of this majestic Queen Square icon happened sixty-two years ago this week. The Wolverhampton Hippodrome framed through the arch of the Queen Arcade, shortly before the week commencing – Monday 13th February and Week. in the World Famous Revue – MAGICANA. Next week LEE LAWRENCE and Variety. Sunday, February 19th at 7.30; SID PHILLIPS AND HIS BAND, Popular prices. THE LOCAL PRESS WEREN’T OVER COMPLIMENTARY WITH THE MAGIC SHOW. The Express & Star Theatre Critic at the time; wrote in his column – Presenting what is described as a World Famous Mystery Revue, Illusionist Virgil, does to some extent live up to his reputation. Because it is a mystery that he should be world famous. A Christmas Pantomime at the old theatre in the 1930’s packed the house for the towns poor children’s Benefit Fund. Virgils hopeful Illusion… the audience on a Monday night! 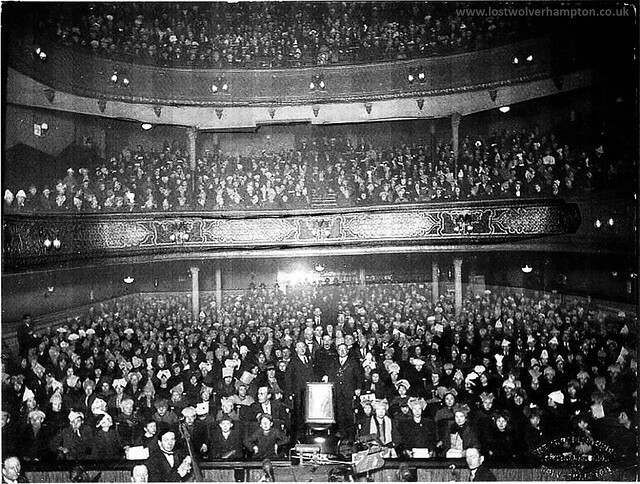 A full house, such as the one above would be seldom seen at the Hippodrome in the 1950’s – Although at the beginning of 1956 the big bands of the day were still packing them in on Sunday nights but the weekly shows were beginning to lose the sparkle of the ones seen before and just after the war. The likes of Jane from the Daily Mirror with her risque act were still scraping in a certain type of audience, but the box office was certainly struggling, perhaps also due to the new arrival of television. But the burning question of how it happened is still unknown. 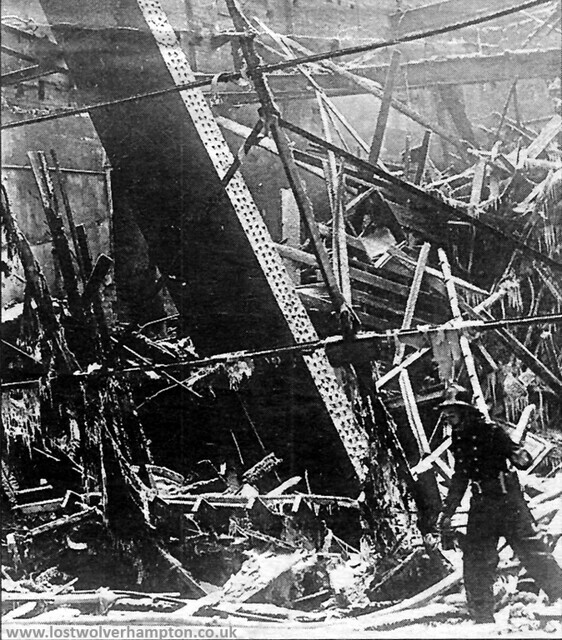 A fireman searches among the wreckage after the fire in 1956. It was never discovered how the fire had started but there were many suspicious rumours about at the time. What we do know is that the fire broke out at around 3.a.m. on the morning of Sunday, February 19th, 1956. Some four hours after the Magicana company left the theatre. The firefighters faced a horrible task, despite the heat from the fire, the freezing February conditions turned spray from their hoses into ice on their uniforms, and the trolleybus wires in Queen Square sagged under a mass of icicles. Was that the fire would spread to other buildings such as the old Edwardian Queen Arcade opposite, as a strong northeast wind blew burning debris across the square toward it. A Surprise though was in store for the Sunday evening performers. Kenny Ball speaking later about arriving in town with the Sid Phillips band said; when they arrived on Sunday afternoon they were most surprised to find the theatre had burned down. So what do I recall of this old Music Hall? Well, there had been a Music Hall operating close to the corner of North Street and Queen Square, for at least 40 years before the purpose-built Empire Theatre opened here in 1898. It is listed in 1874 – as the Museum Concert hall in Cheapside – fronted by the “Boot and Star Inn”. In The newly named Queen Square. 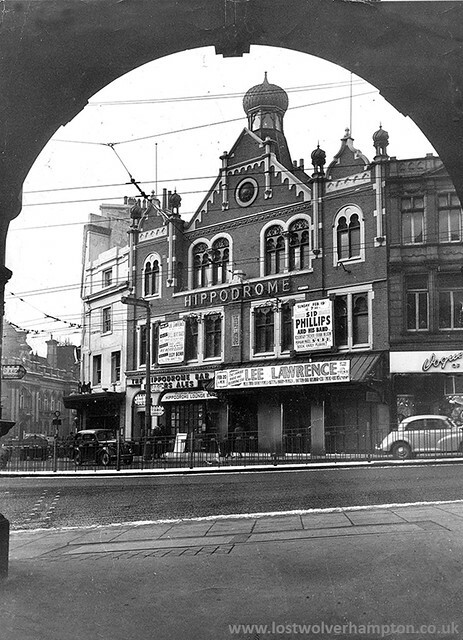 In 1921 the Theatre was modernised by well-known architect Bertie Crew, and the new Hippodrome emerged from the old Empire Palace. 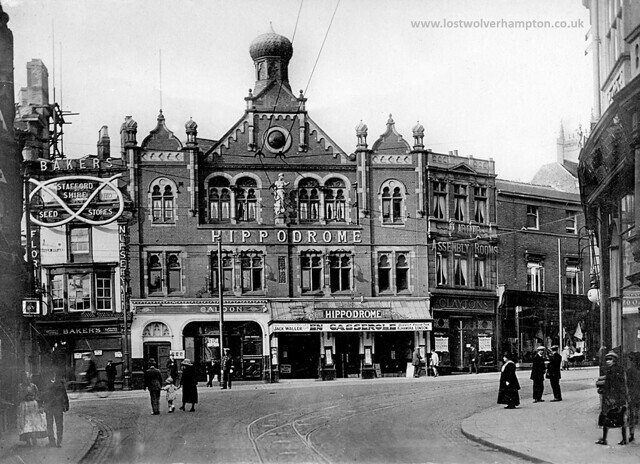 The Wolverhampton Hippodrome in Queen Square was never replaced after the blaze. Happening as it did during the night perhaps nothing could have prevented it burning down, even so, it was a body blow for many Wulfrunian’s who had very fond memories of the ‘Hippodrome’. It’s very sad that the elegant frontage could not have been saved. Two years later, it was replaced by the bland concrete facade of the “Times Furnishing store”. The consequential loss of visual value to Queen Square can only be appreciated by those old Wulfrunians who remember it; as do I, in the 1950’s when I believe the town looked its best. Another mysterious fire, one of many to destroy historic buildings in Wolverhampton. We must hold the record for suspicious fires.A great loss to this city,and its future generations.